Many books on break-up healing offer advice on how to get over your ex and find love again. It’s Just A Break-Up is different. Instead of looking at the break-up experience as a time to prepare for the next thing, It’s Just A Break-Up helps you heal and grow from the experience, so you can have a better chance of attracting back your ex. The book draws from my entire career’s worth of helping clients at all stages of grief, healing, recovery, and dating an ex. It’s comprehensively well-researched to help you process your break-up in the healthiest way possible. The break-up experience is one of the most painful processes in our lives, It’s Just A Break-Up will not stop you from experiencing the pain of the loss, but it will help you move through the grieving process as quickly as possible and let you move on to trying to get back your ex. Working the many exercises provided in the book will aid in your healing, understanding of your patterns, beliefs and thought processes that contributed to the break-up, and transformation into a better and more emotionally confident person. The focus is on you and permission to grieve and heal. 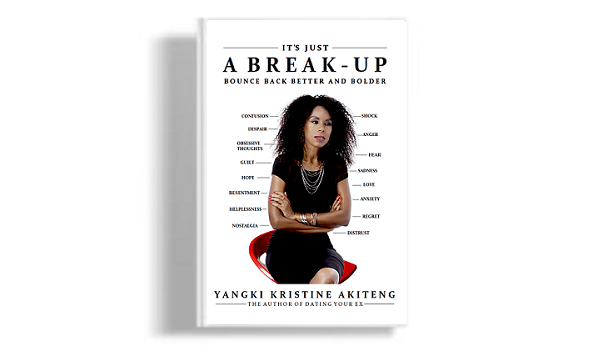 But what makes It’s Just A Break-Up a must-read for anyone trying to get back their ex is that you will not only come out the other side healed and recovered, you will have the tools and skills to deal with the stress of trying to get back with an ex. This is because It’s Just A Break-Up is not just about healing and recovery, it’s also about emotional resilience, that ability to manage emotional ups and downs with greater ease, and be flexible in a way that you face challenges head on confident in your ability to handle whatever comes your way – and a lot comes your way when trying to get back an ex. With It’s Just A Break-Up you will be working on your emotions and showing your ex that you are changing and becoming more emotionally resilient, emotionally mature and emotionally intelligent. And your ex will see you “change” as it happens, right in front of his or her eyes. Why is this important and crucial to getting back your ex? Most exes (and justifiably so) don’t “wait” for you to heal or take control of your emotions. Their lives goes on. Most people don’t believe people change, again justifiably so.. So many people say they have changed but it later turns out they haven’t changed at all. Exes are mostly suspicious of someone who disappear for sometime and reappear claiming that they have changed. But if they witnessed you changing, they are more likely to believe their eyes and ears, than believe your claim that you have changed. The tools and exercises in the book are timeless. It’s a book you will be happy and proud to hand down to your children, grand children and generations to come. Used together with Dating Your Ex, the chances of getting your ex back increase dramatically. Note: This is not an eBook you download to your computer, ipad or phone. This is a hardcover printed book shipped to the shipping address you provide at checkout. Just in case you are concerned about privacy, the title of the book is not printed on the shipping envelop, and the sender’s address is L’AMOUR FOUNDATION’. Please note: There is no return and no refund for this product. It’s made me realize that I will be OK. Highly recommended. Well written book that teaches you how to deal with daily disappointments and hurts. Love, love, love this book! I would have gladly paid four times for the inspiration and practical tools I’ve been able to implement after reading it. One of the things this book has done is help me understand myself better; how my thoughts and emotions influence my behavior and relationships. Thank you for writing such a wonderful book. It opened my eyes to the fact that as much I’d like to think he treated me unfairly, I need to be honest with myself and stop hiding behind my own lies and distortions of the truth. I had lied to him so much and he deserved to know nothing but the whole truth. Although very painful, it is liberating for me to get it all out in the open. I noticed that he seems more open and relaxed. I have both of your books and it’s like talking to you and you saying everything I feel in my spirit. It’s Just A Break-Up has transformed not just the way I approach relationships but the way I approach life. I can truly say I am bouncing back better and bolder. For that and so many other things, Thank You. Many of the questions I wondered about after a loved one leaves one broken were answered in this book. Arrived on time and in great condition. It is thoughtful, compassionate, knowledgeable, loving and delivered in a manner that is filled with hope. I received my book two days ago. This is the hardest thing I have ever been through and your site and books is the only thing keeping me sane. Everyone is saying I need to let her go, cut her off and move on but I am not ready yet. We still tell each other we love each other and your dating your ex ebook has shown me that we can start over. But when I get emotional she withdraws because she says it hurts her to see me in such pain. I need to get my emotions in control and work on being the emotionally attractive person she fell in love with. I read a few pages and I am very encouraged that your book will help me. Thank you. This book has helped me find the strength to move forward. I turn to it every time I feel emotional about my ex.